British midland airways is currently the second largest airline at the London Heathrow airport. Actively operating for over sixty years, the airline operates over 40 aircrafts and flies to more than forty destinations worldwide. The airline is also a member of the star alliances as of 2000. Flights within the UK include airports such as: Aberdeen, Belfast city, Birmingham, Bristol, Glasgow, London, Manchester, Newcastle, and Norwich. The airline also covers most of Europe including: Athens, Barcelona, Bergen, Berlin, Bologna, Brussels, Cologne, Copenhagen, Dublin, Düsseldorf, Esbjerg, Frankfurt, Geneva, Gothenburg, Hamburg, Helsinki-Vantaa, Krakow, Lyon, Madrid, Malta, Marseille, Milan, Moscow, Munich, Naples, Nice, Oslo, Stavanger, Stockholm, Toulouse, Turin, Vienna, Zurich, to name a few. Flights into Asia and the Middle East cover the following cities: Almaty, Amman, Baku, Beirut, Bishkek, Damascus, Dammam, Doha, Dubai, Jeddah, Riyadh, Tbilisi, Tehran, and Yerevan. Oversea flights to North America, South America and the Caribbean include the following destinations: Anchorage, Atlanta, Boston, Calgary, Charlotte, Chicago, Columbus, Dallas, Denver, Detroit, Halifax, Houston Texas, Las Vegas, Los Angeles, Miami, Minneapolis, Montreal, Myrtle Beach, New York, Orlando, Ottawa, Philadelphia, Phoenix, Ortland, Raleigh Durham, Sacramento, Salt Lake City, San Antonio, San Diego, San Francisco, San Jose, Sao Paulo, Seattle, St. Louis, Toronto, Vancouver, and Washington. Finally flights into the African continent include: Addis Ababa, Cairo, Cape Town, Durban, East London, Freetown, Johannesburg, Khartoum, and Port Elizabeth. 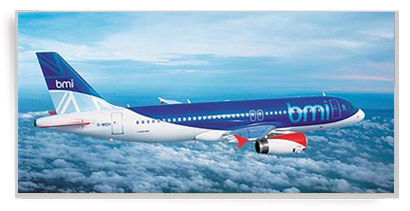 In order to maximize customer satisfaction, with no long lay over, and ensure a better guided trip, British Midland Airways has a code sharing agreement with major airlines such as: Air Canada, Air One, Ethiopian Airlines, Etihad Airways ,TAM Linhas Aéreas , Blue1 ,Air Malta , Lufthansa , LOT Polish Airlines , Egyptair ,Air New Zealand,Olympic Airlines ,Austrian , Turkish Airlines, SriLankan ,Transaero , US Airways, and Virgin Atlantic, among the many. On board, the airline offers two classes of service, business and economy. Economy class passengers have the option to check in on-line, over their mobile phone, or at a self check in at the airport. On board the economy class passengers can enjoy the in-flight magazine Voyager, or Voyager entertainment system which offers a wide range of movies, songs, news, and video games. Duty free shopping is available as always. Complimentary drinks and snacks are also provided on most flights, while meals are offered on long flights. Business class passengers can enjoy the luxury of being transported by a personal chauffer from their residing place, to the airport on the departure as well as upon arrival. Most destinations also provide this service for the business traveler upon arrival. Over the phone arrangements are required 48 hours in advance for this service. Business class passengers have the option to check in on-line, over their mobile phone, at a self check in at the airport, or at a check in desk at the airport. On board they can enjoy the Voyager magazine, as well as the Voyager entertainment system. They can choose from a wide range of international cuisines, alcoholic and non-alcoholic beverages, as well as other benefits. We offer all destinations of BD including missionary fares to and from Canada from Various Points in the world. Please, call 416.484.814 4and find out as to how we could be of service to you.